The objective of this SWOT Science Team project is to aid pre-launch preparations and scientific development for the surface water hydrology component of the NASA/CNES/CSA Surface Water and Ocean Topography (SWOT) mission. While SWOT holds strong promise to be a transformational mission for land surface hydrology, several key tasks remain, including to 1) establish benchmark monitoring sites, standardized measurement protocols, and international partnerships needed for quality calibration/validation of SWOT hydrology products; 2) demonstrate that SWOT inundation area mapping for rivers, lakes, and wetlands is feasible; 3) demonstrate that quality SWOT discharge retrievals for large rivers are feasible; and 4) demonstrate exciting new science from SWOT-like measurements. To these ends, this project will achieve the following as part of the first SWOT Science Team: 1) Establish new SWOT calibration/validation sites through a formal new collaboration with the Water Survey of Canada; 2) Collect unique "SWOT-like" field and remote sensing datasets for use by the Science Team, river discharge and water/land mapping algorithm teams, and broader SWOT community; 3) Conduct phenomenology studies of potentially important impacts (vegetation, sedimentary deposits, ice, and wind) on SWOT backscatter and water surface elevation (WSE) retrievals; and 4) Gain scientific knowledge of the impact of permafrost on the form, hydraulics, and water surface elevations of northern rivers and lakes. Together with our Canadian colleagues, we have now selected the first Canadian Tier-1 SWOT Cal/Val site (North Saskatchewan River near Prince Albert, Saskatchewan). Also, the PI has secured funding to fly AirSWOT over potential Canadian SWOT Cal/Val sites this summer, as part of the 2017 NASA ABoVE flight campaigns. Finally, we have used archived Landsat data and Google Earth Engine to evaluate suitability of two potential SWOT Cal/Val sites. Each of these three areas is described in this investigation plan. 1) Selection of the first Canadian Tier-1 SWOT Cal/Val site. Through a series of telecons and two physical meetings with Co-Investigator Al Pietroniro (Director of the Water Survey of Canada) in Saskatoon and Montreal, we reaffirm that this new U.S-Canada partnership seeks to establish 3-4 calibration/validation sites along four major Canadian rivers by the end of the project. In the original proposal, the proposed sites were the North Saskatchewan River near Saskatoon, the Arctic Red/Mackenzie River near Inuvik, The Slave/Peace near Fort Smith, and the Ottawa River near Montreal. These sites were proposed in order to optimize scientific impact (spanning a N-S permafrost gradient), logistical ease, and (ideally) locations inside the nominal planned orbits of the SWOT Fast Sampling Phase. Following ongoing negotiations and two site visits with Al Pietroniro of ECCC, we are pleased to report that despite budgetary pressures at ECCC, the Canadian commitment remains strong at this time. Together with our Canadian colleagues we have selected the North Saskatchewan River as the first Tier-1 SWOT Cal/Val site to be developed this spring 2017, beginning with installations of a new permanent gauging station, and a permanent array surveyed pressure transducers spaced along ~40 km of river length (Figure 1). 2) Leveraging of AirSWOT ABoVE flight campaigns. In 2016 a proposal by PI Smith (UCLA), Co- PI Tamlin Pavelsky (UNC-Chapel Hill) and Co-I Dennis Lettenmaier (UCLA) was selected to bring AirSWOT to the 2017 NASA Arctic-Boreal Vulnerability Experiment (ABoVE). This project will study the resilience of surface water lakes, ponds, rivers and wetlands in response to thawing permafrost, capitalizing on the long flight lines of the which will span a full spectrum of permafrost conditions (permafrost-free to continuous permafrost, low to high ground ice content), ecosystems, climatic regions, topographic relief, and geological substrates. Remotely sensed surface water elevations and areal extents, and mapping of visible manifestations of permafrost (e.g. thermokarst) are key targets of study and will be obtained using the AirSWOT Ka-band interferometric radar and Digital Cirrus Camera (DCC) optical camera imagery, as well as planned ABoVE UAVSAR, AirMOSS and LVIS airborne acquisitions and ancillary data products (permafrost maps, ArcticDEM high-resolution digital elevation model). This obviously presents a tremendous opportunity to fly AirSWOT over planned Tier-1 SWOT Cal/Val sites thus supporting this project NNX16AH83G as well. ABoVE flight planning is currently nearing completion with ABoVE flights over planned and potential SWOT cal-val sites. Figure 2. Nominal flight lines for 2017 NASA ABoVE AirSWOT flights in Canada and Alaska. Flight hours will be funded by NASA ABoVE and AirSWOT data processing funded by by the SWOT mission at JPL. Two SWOT Cal/Val sites will be established (N. Saskatchewan River, Canada, Sagavanirktok River, Alaska). In addition to obtaining AirSWOT and ground Cal/Val data this summer, a key science objective of this SWOT ST project is to study remotely sensed river hydraulics in permafrost vs. permafrost-free regions. After transitioning to a tenure-track faculty position at UMass-Amherst last fall, Co-I Gleason has been leading an effort to map the width variability of rivers entering the Arctic Ocean using archived Landsat data and Google Earth Engine. 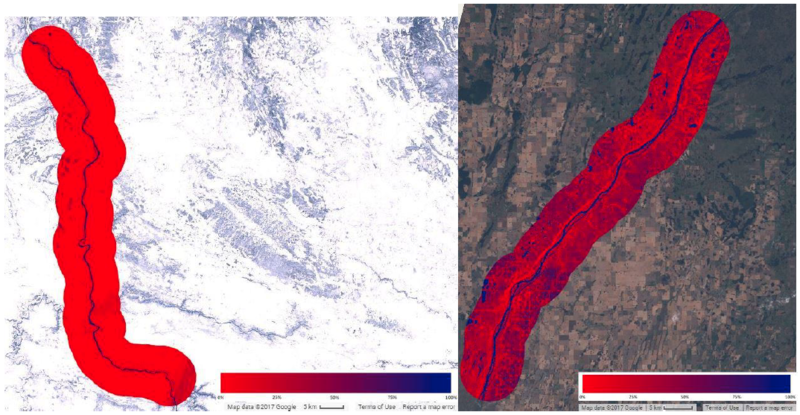 Tapping the computational power of Google Earth Engine should allow us to assess the fluvial geomorphology of potential cal-val sites a priori. 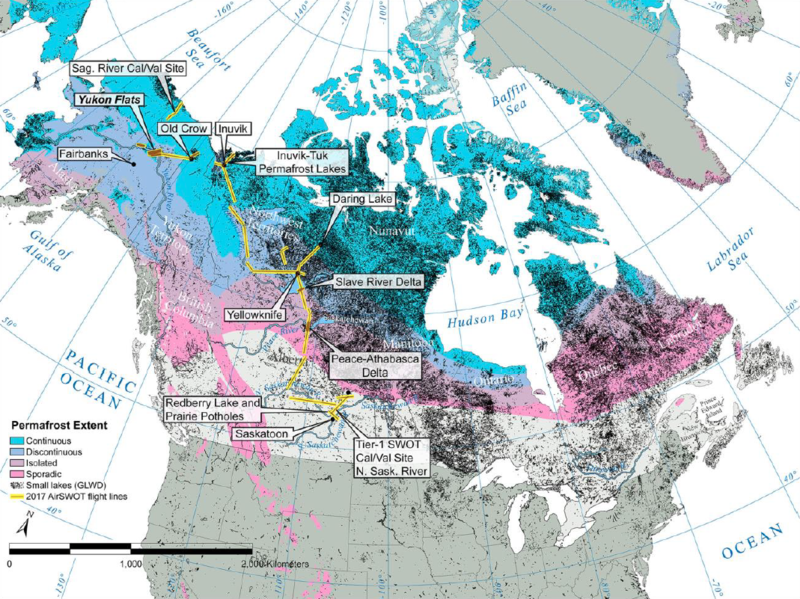 For example, we have conducted intensive mapping of the Arctic Red River, a continuous permafrost river and potential Tier-1 cal-val site as it is under the SWOT Cal/Val orbit and has an operational ECCC gauge. Results obtained from this mapping on the Arctic Red indicated that this river is so- called 'low b,' which means it is width invariant. However, a further topographic analysis revealed that this river is likely affected by layover and is thus not optimal for a cal-val site. Similar intensive mapping was performed over the North Saskatchewan River, and this mapping confirmed the suitability of this site for cal-val. Figure 3 shows these frequency maps for the Arctic Red and North Saskatchewan Rivers. Figure 3. Inundation frequency maps of the Arctic Red (left) and North Saskatchewan (right) Rivers. Blue represents higher inundation frequency (i.e., a pixel was classified as water in a high percentage of images), while red represents lower frequency. Both analyses were limited to June, July, and August, using Google Earth Engine to process archived Landsat images (1984-present). Note the width invariance of the Arctic Red, which led the project investigators to reject it as a SWOT cal-val site. 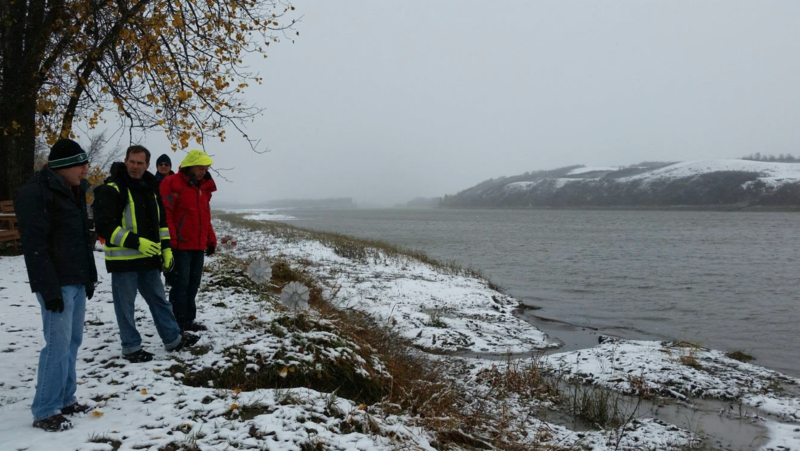 The N. Saskatchewan River, however, was determined suitable and Tier-1 Cal/Val installations have begun.